Students in grades K-2 had the opportunity to be a part of an after-school enrichment that also included a service learning project. In total, there were approximately 45 students from our elementary school making this a very successful event. 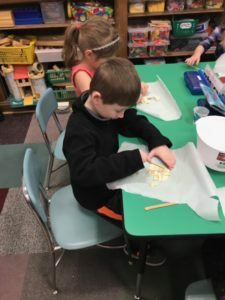 The K-2 students measured, mixed, and formed cat and dog treats that were baked and given to the Hudson Mohawk Humane Society. The highlight was a visit from a shelter dog. Our students have given many great things to the animal shelter to help our fur friends.See more photos here.